The passenger airbag is located underneath or is part of the passenger dashboard. Older models are usually single-stage and newer models are dual-stage. 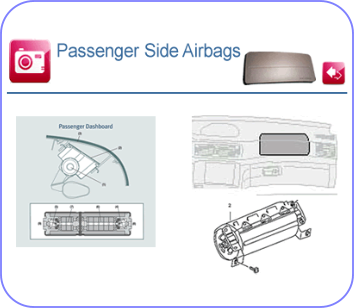 Although most earlier passenger airbags included the cover there are many new variations where the airbag is underneath the dash and is not sold with the cover. The passenger airbag comes in many styles. The single stage version can be identified by a single connector with two wires. The dual stage passenger airbag has four wires leading to one connector. 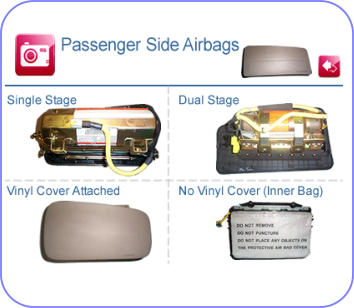 Some airbags come with the cover attached and others that don't are called inner-bags. Passenger-side air bags reduce the overall fatality risk of car passengers age 13 and older by a statistically significant 13.5 percent. It is estimated that an additional 88 right front passengers ages 13 and older would have died from 1986 to 1995 if passenger cars or light trucks had not been equipped with passenger-side air bags. To date only one passenger, a 98-year-old female, has died as the result of an adult passenger-side airbag related injury. Passengers: Properly restrained adults sitting back in the seat are not at significant risk from an inflating airbag, but there is a risk for children and infants in the same position. Children are safest when properly restrained in rear seats. Rear-facing infant seats should never be placed in the front passenger seat with an airbag. Infants with medical conditions that require constant observation may need to ride in the front, and then an passenger airbag switch would be needed. If a driver transports too many children to put them all in back seats, an older child may ride up front with the seat all the way back and the child secured in a lap/shoulder belt sitting back in the seat. If a driver does get a switch, it should be used to turn off the passenger airbag only when an infant or child must ride in front. It should be noted that vehicles without rear seats are required to have an on/off switch installed for the passenger airbag; this includes some pickup trucks and some small cars.